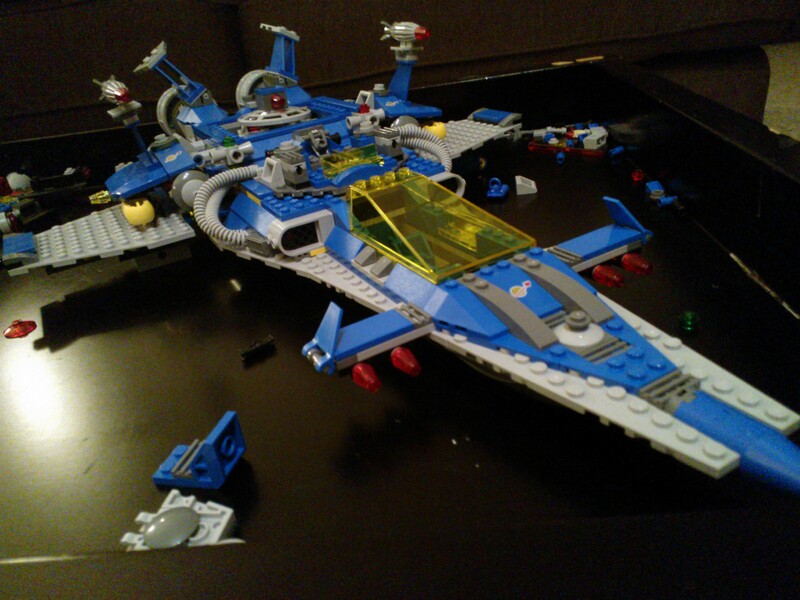 For my birthday my wife bought me the LEGO kit Benny’s Spaceship. For anyone who’s seen The Lego Movie you’ll get the joke. It’s the outrageous monster outer space cruiser the little blue 1980s LEGO astronaut with the busted helmet finally can unleash his manic creative energy to build in a fit of frenzied, 9-to-14-year-old glee near the end of the movie. Watching that moment in the movie, and holding the box, I felt the rekindling of that same mania, dull and dormant since it last animated me 30 years ago. It was then when I realized I had essentially failed that younger version of myself. Because if I had been true to my 12-year-old ambition, I would be working at LEGO right now or I would have worked on The Lego Movie. Or, at least, I would have visited Legoland somewhere in the world. But I had Benny’s Spaceship and I found the visceral pleasure of assembling it did not fade with age. At the same time I happily watched a switch flip in the mind of my four-year-old son. What had been a jumble of abstract multi-colored DUPLO blocks now took solid form in his mind. He began to assemble cars, airplanes, helicopters out of the pure form. And then, inspired by his favorite television show, he began to “transform” them. Snapping a few pieces into different positions, he turned his vehicles into robots. It took me years to do something like that. I received my first LEGO kit, a train set, from Japanese friends when I was about five years old. From then on, LEGO was, with the possible exception of plastique models, my favorite things to play with growing up. I rarely bought blocks for their own sake and always built the pre-designed kits, but they eventually became something else entirely – ships, planes, submarines, spacecraft, battlefields, the whole populated physiography of a boy’s imagination. Considering how expensive the kits were (and continue to be) they are probably the most cost-efficient toy on the market. You can make them into almost anything you want. At the risk of putting down the pure joy of childhood creativity with the needle of an adult’s hindsight, it’s been interesting to see how the same processes I cultivated on the floor of my bedroom as a child evolved into grown-up habits and skills. The Lego Movie sets up a rigid dichotomy between the instruction-following if happy-go-lucky automatons and the rebellious, anarchic Master Builders. But any organization needs both to succeed; indeed any person needs both creativity and attention to detail in order to function in modern life. It may surprise my friends and family to find me poring over a LEGO instruction manual (or any manual for that matter). Following instructions and conforming to rules are not my strength, but even as a pre-teen I would regularly do so in order to get the product shown on the box. That attention to detail – an ability to focus and work precisely, behaviors not engrained in my character – may have been all I needed to get through school and my first few jobs. But once I completed the kit I could break it down and use the new pieces to build other things. I could build almost anything I could imagine or – a different notion entirely – a model of something else. I had a whole fleet’s-worth of space-faring warships of my own design, but I found these to be less difficult to build because the problem set was more flexible – it could be whatever I wanted it to be. On the other hand, trying to build a scale model of some real (or pre-existing) object was a much greater challenge. Because the greater the fidelity, the greater the achievement – and with the blocky, finite resolution of the LEGO bricks, that was quite a challenge. I recently found a book published by LEGO diving into the design of it Architecture series which explores this concept in some detail. Replicating the Eiffel Tower, the White House or the Taj Mahal to high fidelity at 1/25th scale in a place like Legoland is impressive but, given the size, relatively easily done — and especially so after seeing how The LEGO Movie was designed. But what about at a scale that will fit in a box on a shelf? The Architecture book explores the engineers’ iterative process to find the right design, scale and parts to faithfully replicate these icons. I went through a similar process as a child and tried to do the same thing as I started building again as an adult – replicating the ships from “Guardians of the Galaxy,” say, and seeing if my children could recognize them when I finished. This was (and is) a significant life lesson in engineering and problem-solving. Engineers like to say that their job is about what can be – that is, solving real-world problems in real time for real people. The situation, tools, and equipment will always be inadequate but your goal is to get the best outcome and improve for the next time. I learned almost too late that creativity is a tremendous part of the sheer physical aspect of getting things made, fixed and done. Without creativity, the greatest achievements in science, technology and engineering would have never left the chalkboards of theory. I have applied a creative, half-now-is-better-whole-later approach to problem-solving most of my life. But creativity has a curious double edge. I tried once again to model the venerable Enterprise from Star Trek – introducing my children to yet another commercial franchise – and I was as disappointed with my effort now as I was as a boy. I instantly recalled a good friend who was a LEGO prodigy. I remember his uncanny ability to assemble the Enterprise on virtually any scale — as an inch-long model or a foot-long version — with incredible fidelity. When I was younger I was jealous and confused by his ability – as I was by those who could do other creative things “better” than me. They could draw, sing, play music, and paint better than I could. I didn’t understand what this “better” was – why, in a group of people, one object would necessarily be valued more than another. I was confronting a fundamental question of aesthetic philosophy that I would never be able answer but one that fundamentally separates an art from kitsch. Rifling my hand through the bricks I felt like I was back on my bike again. Thirty years had passed but very little had changed. I remembered their proportions, how pieces fit together, recognized their limitations, delighted to find new blocks and tools. There was something intensely familiar and calming about the focus on what I was building. And unlike work or writing, I didn’t feel any tension when my focus was broken by distractions, such as when my son would triumphantly display his latest LEGO transformer creation. Happily we could enjoy this activity together. Today we call this a mindful activity, also at the risk of killing off the pure notion of play. It is interesting that I don’t feel my mind wander, I don’t use the time to think about other things, I don’t worry (usually) about other things I have to do. But when I am building, I am focused and happy. I am usually pleased with the “good-enough” outcome I produce. I can play with my children. It is a finite activity that I can start and complete within an hour or so. I have boxes of my old LEGO bricks piled in the basement. I hesitate to bring them into the mix. They are decades old, undoubtedly creased, worn, and dirty. I like the shiny new bricks and the new parts and gears that came with Benny’s Spaceship. I suppose I worry most about the memories they will evoke and the fact that they are, in fact, children’s playthings. I shouldn’t be embarrassed by that and I’m probably half-justifying the sheer pleasure and enjoyment I have “playing” – which doesn’t quite capture what I’m doing – with them by writing about how LEGO affected my development as an adult. I guess I just don’t want to think about them never being a part of me. This entry was posted in Books and tagged aesthetics and politics, architecture, art, engineering, LEGO, The LEGO Movie. Bookmark the permalink.